Temporomandibular ligament is located on the lateral side of the temporomandibular joint. It is also known as the lateral ligament of the temporomandibular joint or external lateral ligament. The temporomandibular ligament is mainly made up of diagonally oriented fibers. The temporomandibular ligament is made up of two short, narrow fasciculi, which are located one in front of the other. It attaches superiorly towards the lateral side of the zygomatic arch and towards the tubercle on its lower margin. It is inferiorly attached towards the lateral surface as well as posterior margin of the neck of the mandible. Superior part is broader compared to inferior part. Its fibers are pointed obliquely inferior and posteriorly. It is enclosed via the parotid gland and via the integument. Temporomandibular ligament restricts the depression of the mandible and balances the lateral side of the joints. 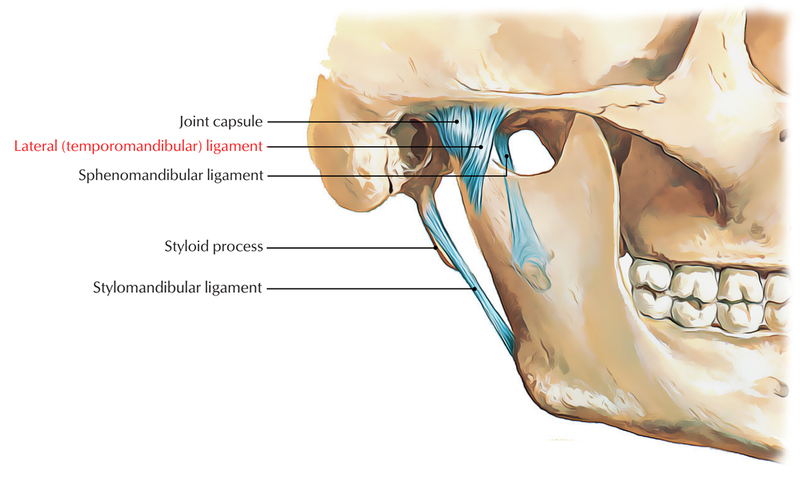 Along with stabilizing the lateral portion of the capsule of the temporomandibular joint, the temporomandibular ligament also balances the intra-articular disc. Due to being located laterally, the temporomandibular ligament opposes the draw of lateral pterygoid muscle and balances the medial-lateral placement of the disc inside the joint.